All performance photos on this site copyrighted 2013, Patrick Dixon & Veronica Kessler, www.PatrickDixon.net unless otherwise noted. These are the writings, musings, song lyrics and tales tall and small of the commercial fishing industry and the life and adventures that float within it. From skippers and deckhands, cannery workers and deck grunts on salvage boats, from women trying to carve out equality and respect in a traditional “man’s world” to greenhorns and lifetime fishermen, these are their stories in their own words. Many of the pieces are also accompanied by audio files of their authors performing them to a live audience. Many thanks to KMUN radio and Fred Van Horn for their help in recording these performances. 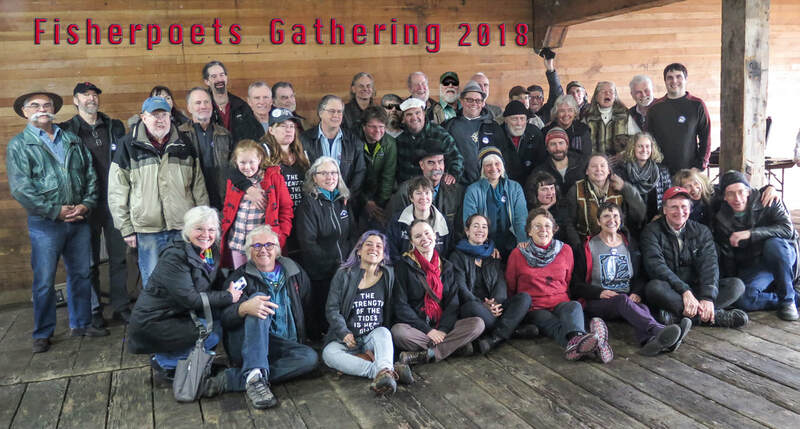 The material you read and listen to here represents a small fillet of what has been caught at the Fisher Poets Gathering in Astoria, Oregon since it began in 1998. If you enjoy this material, you are more than welcome to attend the next FisherPoets Gathering the last weekend in February. All material presented here is the copyrighted property of the creator, and as such should not be duplicated without permission. All Fisher Poets are invited to contribute to IntheTote by contacting emailing us HERE. To listen to the FisherPoets Gathering performances live at the Astoria Event Center tune to KMUN at 91.9 on the FM dial, or streaming on the web at www.coastradio.org. is found at the above link, and features all the videos we can reel in of fisherpoets who have performed live on-camera. Be sure to note that we have playlists sorted by year, though not every year is represented. 2018 is by far the biggest "school" of performances. The most professionally presented videos were graciously produced by Brad Wartman and Elaine Lahey who volunteer for Capital Community Television in Salem, Oregon with permission and grateful appreciation by the FisherPoets Gathering. Brad is a resident of Salem, OR and an avid supporter of the FPG. He produces, directs, and edits FPG-related content that is shown on CCTV-Salem and made available through his YouTube channel (linked above). Elaine is a co-director and co-editor of these videos.You can also find Brad's videos of specific performers here on Inthetote, on their individual pages. In 2014 over 40 fisherpoets joined together to help create an anthology of their work. The brainchild of Chelsea Stephen, an artist and graphic designer from Portland, Oregon, the anthology was edited by fisher poet Patrick Dixon. The collection is a group of seven thematic books wrapped in a cover that when unfolded resembles a fish. For more information, ad samples,, and an email address from which you can order one of the few remaining copies, go HERE.